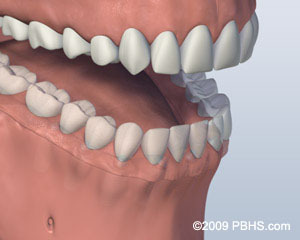 Some people find it difficult to wear and eat with dentures. 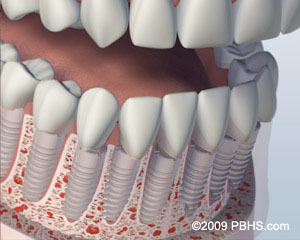 Several implant-supported replacement options are available if you are missing all of your teeth. 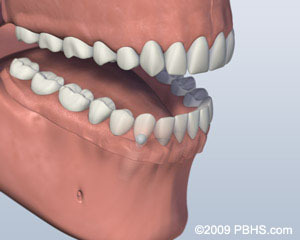 One option is to have two or more implants placed in your jaw and a denture made that snaps onto these implants. 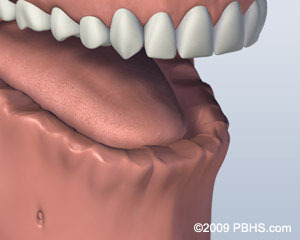 This option allows your lower denture to be more stable while chewing than without implants. However, there will still be some movement of your denture, and sore spots will occur if any food particles, especially seeds, are caught under it. 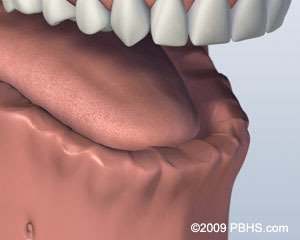 As with all removable replacement teeth, you still will need periodic appointments for denture adjustment. Another option involves placing four to six implants, depending on your jaw size or shape, into your jaw. 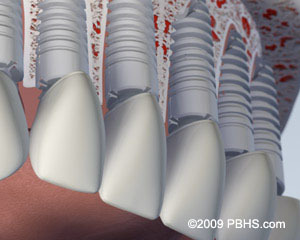 After healing is complete, the implants are connected with a custom-made support bar. Your denture will be made with special internal retention clips that attach onto the support bar, enabling the denture to snap firmly into place. 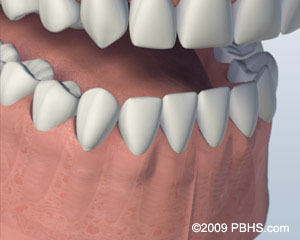 This is called an “overdenture.” The advantage of this option is that it is much more stable than the first option and allows very little denture movement. 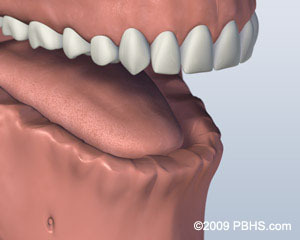 Your denture is still removable for easy cleaning and maintenance. 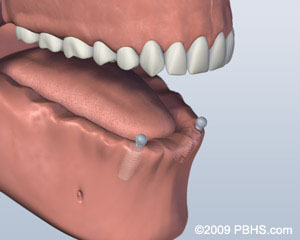 A third option involves placing five or more implants in your jaw and attaching a permanent bridge. Your bridge is held in place by screws or clasps that secure it to the support posts or bar. It doesn’t touch the gum tissue, which allows you to clean under the bridge without removing it. 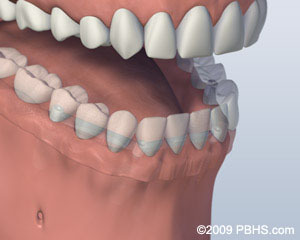 This bridge will replace all your missing lower teeth and will not be removed except at maintenance visits. Although cleaning under your bridge without removing it is more time consuming and requires more dexterity, many patients who want a permanent denture/bridge prefer this option. A similar range of treatment options is also available for your upper jaw. However, because the bone is not as hard as that in the lower jaw, people often need more implants to support their new replacement teeth. Depending upon the number of implants to be placed, it may be possible to eliminate the need for covering the roof of your mouth with a complete denture. This option allows you to fully taste your food and gives you a better sense of its temperature. Your denture will feel more natural. You will still have a removable denture, which makes cleaning the support bar and denture much easier. 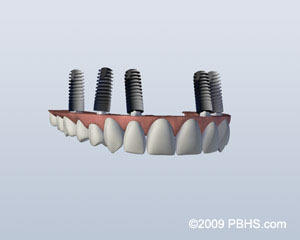 Fixed permanent implant options do exist for the upper jaw so the denture will not have to be removed.